This afternoon I said farewell to a beautiful soul and treasured friend Honey. She came into my life on August 21 last year, the birthday present I had ached for since I was 5. In the time I have had the privilege to be her carer on earth, she has blessed my life and my family with such lessons of trust and true companionship. Her wise ways and gentle nature initiated me into caring for all horses with softness and courage, and she stretched my heart wide so that she might reside in there for an eternity. She was a rescue and it is a profound honour to know that this last year of her precious life has been, I believe, the best one – a life in which she has been able to run free and heal all the wounds her previous life seemed to constantly whisper to us. But the damaged knee has been the one thing that has continued to cause her pain that she has asked to be free from and today we have knelt beside her and let her go to the field of dreams. A gentle nuzzle, a soft sleep and an honoured life that has shaped me in ways I am only now beginning to realise. Farewell my equine friend. Such heartfelt thanks to all those who have been there as we have lived and loved with her. Kim, Lio, Candy, Jazz, Jade, Mark, Kirriley and so many others. Honey, you were a deeply loved member of our family – Tex, Hannah, Jonah and me. We will hold your spirit in our hearts forever. RIP. That is the answer that is already present in the question. All I need to do is go there. And I need to be there more and more. It’s been so many months since I last posted yet the words have not been absent, they have simply taken a form not yet known. All this, in among life and all that claims me yet the enduring presence of Honey in my life has been an umbilical cord to that which is rich and keeps me real. So as the bite of winter can no longer be ignored and the paddocks turn to slippery boot-sucking obstacle courses, there is still joy in going to see my Honey. Yesterday she emerged from a stand of trees to my call, coming to me as two lovers meet, waking with me, not simply following, all the way to the gate. Our one year anniversary of being in each others life is approaching – next month as winter takes a second wind, we will continue to stand in each others presence and I will run my hand up her neck deep within her cosy rugs to warm my fingers where her mane meets the rise of her withers. It’s like tucking in, like sharing the essential need for warmth unites us just a little more. And as I snuggle in my bed some nights with wind howling and snow forecast on the mountain, I want to go to her to check she is ok. But her message to me is clear, ‘I am fine, I am animal. I am suited for this natural change in the seasons’. And in this she reminds me of the same capacity for adaptation I have. Because I have shunned winter in the past, hunched my shoulders against the discomfort of cold that then causes my back to ache for months on end. I have been given a gift this winter because Honey has drawn me out of the confines of my isolation from nature to be in the world more. And in this I find a new relationship to my wildness, to the heat of my own body and its resilience. Honey is happy. Honey is not the depressed mare I first loved. She has come through a tunnel from old life to new, enveloped in love and willing to put past hurts aside and start over with me. For her, for this I am ever grateful. She looks well, she is well, her spirit has slowly replied to the love I could not hold back from her. And she rewards me every time I see her. I recognise how that my intense need to ride away is not to appease some adventure seeking part of myself, it is simply a call to my wildness, to be in nature and limitless. This is Honey’s gift to me now as chaperone and shamaness of a freer me. Over the past two months Honey and I have been healing each other with the help of some very special healers. We have held mirrors to each other and found so many ways our bodies have held the same trauma and manifested the same symptoms. My right shoulder, also hers. My pelvis, never quite the same after children, also part of her body story. Candy, her therapist says, ‘Shes had at least 6 foals, and several that didn’t make it on top of that’ and I get an overwhelming sense of how her body responded, just like being inside her. I know it because I know it for myself too. So Honey has had craniosacral help, acupuncture, ENAR therapy and a more gentle and intuitive form of healing from Candy that I cant quite name. Along side this Kerry ushered my body through a doorway and has given me relief that I haven’t felt in years. Yesterday when I rode Honey she told me her knee was sore. I’d been feeling a twinge in the back of my left knee for days with no reason for it to be there. Suddenly I got it. When I first rode her I was conscious of how much our bodies intersected, how meridians entwined and we became extensions of each other. Now I am pondering how that sense of interdependence exists all the time, how we communicate beyond words and in constant dialogue. Imagine knowing this with all living things. Honey now has shoes on her front feet. It’s worth a try we think. Perhaps it will make her a bit more foot sure, more steady. Kim has assured her it is for comfort, not for anyone to ride her hard. And it helps, it really does. I ride her first in the arena and then quietly along some of the tracks on the property and she is much more confident. Yet I still cant get past this nagging doubt that it is hurting her. And I find my confidence in riding her is waning because her lack of surety feeds mine. And I don’t want to cause her pain. A few weeks ago I had a voice in my head. It said ‘she’s not a riding horse, that’s enough let her retire and enjoy paddock life’. I heard this clearly and knew what it meant but I couldn’t locate it in this time of now. I felt it was a message from sometime in the future but it stays with me and I ask Honey to affirm it for me when she can. Next week an animal healer is coming. She is apparently one of those people who can feel into a horse and know the answers. I know I can do this too but I truly believe there are people out there for which this is a gift. To give Honey every chance, to be sure, I am going to listen to what Candy has to say…what Honey has to say. Today when I went into to the paddock Honey came to me and followed me out to the gate without need of halter or lead. Just like her smooches last time I went to see her, there is a deeper sense of connection between us again. The feeling I had in our visits during January, that feeling that we weren’t connected has been replaced by a sense that we are close now whatever happens. I am out for a movie and a snack with a friend I have started to get to know more deeply in the last few weeks ‘Who are your friends?’ she asks me, and I pause for a moment. I have some lovely women friends, although the theme of my life seems to be that the women I most relate to always feel the urge to seek new adventures and head off to different towns, different states, sometimes different worlds. But there is one new friend that I know will always stay and I wonder how I offer her name without sounding like loser. ‘One of most nourishing friendships this past 6 months has been with Honey, my horse,’ I say, and it is a truth that cannot be explained, but can be felt. When a horse enters your life and your heart there is a friendship that is elevated above the ruminations of ordinary people. . Later I recant this story to Kim – she gets it. She knows better than I the long hours of devotion spent with the horse and the reward that flows as a blessing through your veins, though your life. It is s bright day and Hannah and I arrive to the quietness of a near deserted property. We bring in Honey and Coco and hang out for an hour. Without design on the day we ease into the space of saddling and Honey accepts her new saddle with grace. For the first time Hannah and I set out, just the two of us, for a ride. Around the dam, around the property, just mother and daughter riding their beloveds. I say to her ‘ this makes me so happy to be doing this just the two of us.’ Her smile says more than words. Honey trots and moves with my request. Her feet are holding well so we have decided to try a pair of front shoes and see if that helps even more. Her knee, the thing we really thought was going to be problematic is not an issue. I am learning. And I have learnt much. Especially these past few weeks. 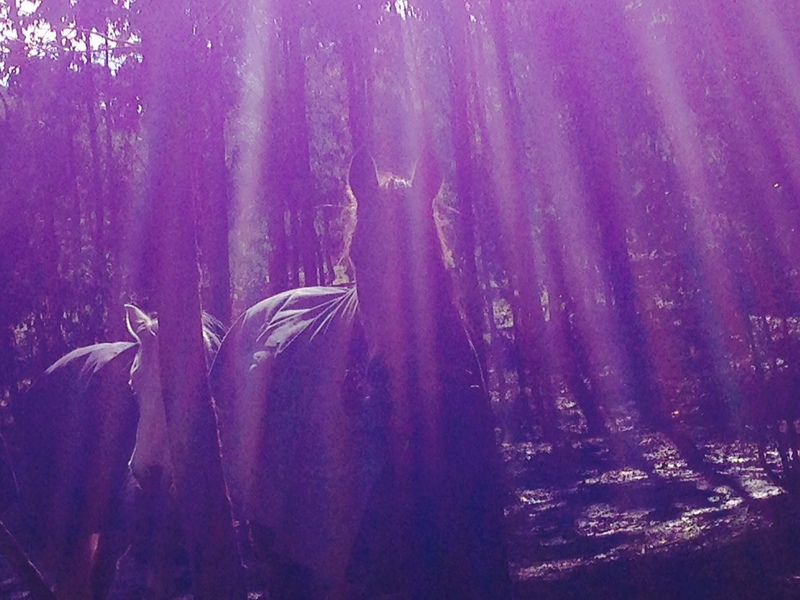 I have spent five days on horseback up in the High Country doing things I never imagined I could. I have lived and breathed horses for this time. Sleeping alongside their holding pen under the brightest full moon, in a swag so the stars could kiss my forehead. I have climbed obscene mountains and plunged through countless river crossings. 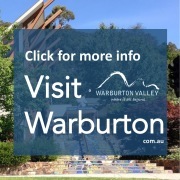 Over 110 kilometres of mountains and trails through the magnificent High Country. Over Mt Stirling and down the Howqua River, I rode through my delight, my pain my fear, through myself. Until I emerged and I felt I had earned my place to call myself a horse rider at last. And it was a baptism to country as well. The spaces inside me called to feel the ruggedness of the mountains and the essence of the dirt from which my bones were formed. I felt a part of the land, rightful in my place as a woman who can survive, in bush and in life. I feel my resilience and the historical thread that I carry to the women who pioneered this land centuries before me. I feel my place in this line and I feel for the first time my real place in this land, this life. It is a gift I was not expecting. I do not need to don the Akubra or uniform of the bush woman, instead I know that I am this and it fills me with love and relief. It has been different between Honey and I since I returned. I have been reluctant to ride her, until today. 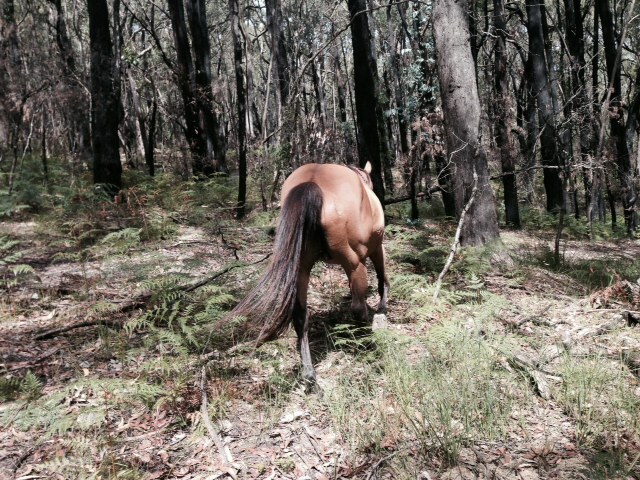 Last week when I had the first opportunity to really hang out with her (since I got back from my ride), just the two of us, I took her for a long bush walk – that seemed enough for both of us. I think I wanted to hold the spirit of my adventure, was scared I might go back to ordinary or not much horsewomen back in my old place. But today I rode and it was an echo of the life I touched during that five days out in the world. It has all come with me, and it has bought me here…it has been unfolding for decades. The story begins on 18/8/14 – scroll down and read in reverse for the full tale. A constant reminder to seek pleasure in life. The sweet succulence of honey on my lips evokes the truth of all that is real and worthy for me. Honey is healing, fluid and rich. It reminds me of the best parts of myself and the sweetness I deserve. Everything I have ever loved, I have called 'honey'. 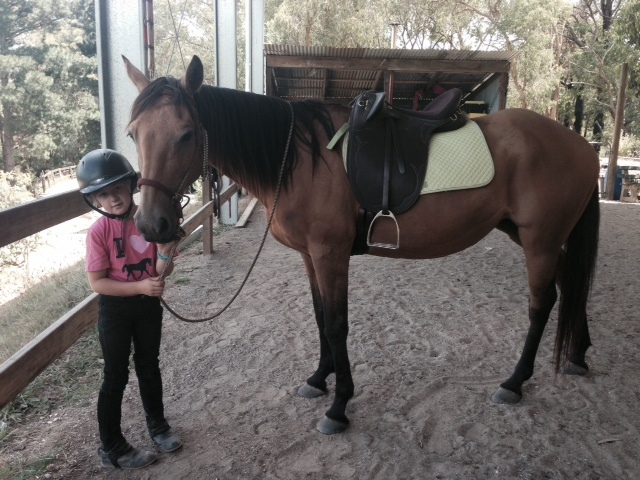 Honey is a 15.3 hand buckskin quarterhorse mare. She is about 15 years old. As a rescue, we know very little about her history but her body tells us she has had many foals (most likely because her unique colour would have made them valuable), and she was last purchased at the sales because she was in foal and then discarded once the foal was weaned. Every year, more than 40,000 horses, just like Honey, are slaughtered for dog meat or human consumption (export). 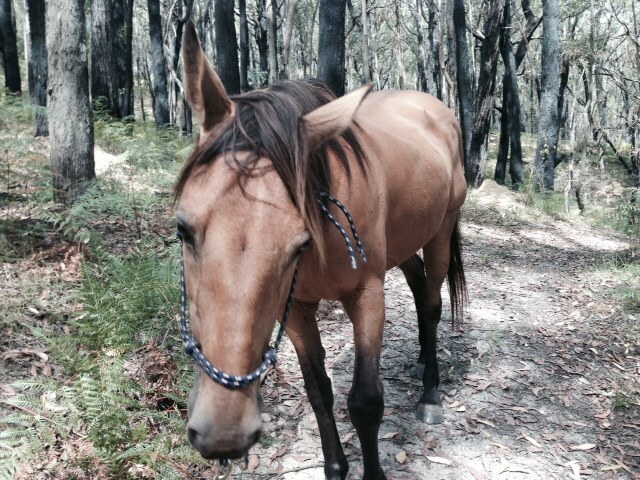 Honey has a forever home now – if you can help a horse, or make a donation to help those who help horses, please do so. I recommend White Angel Horse Rescue and Wedgetail Rides for their integrity and dedication to giving horses a second chance.